The Durban Fashion Fair (DFF), celebrating a seven year run ended on a high note on September 22 with an award ceremony recognizing local and international emerging and established designers. Themed Afrofuturism and hosted by much-loved radio and television personality Anele Mdoda, the highlight of this four-day fashion extravaganza celebrated the talents of the future and recognised the maestros of the present. The most coveted award of the evening - the Durban Designer of the Year 2018 – went to Zama Mathe, head designer of the brand Zarth. Mathe is a protégé of the DFF and head of a growing and successful business. Founded in 2009, Zarth has evolved into a creative design house employing a fully qualified team of professionals. The fledgling brand made its DFF debut in 2013, earning her an internship to Milan, Italy. She has participated at the DFF every year since then. This is the second year she has clinched the award, having also being chosen as the DFF Designer of the Year title in 2016. This year’s Best Ladieswear Collection 2018 Award went to Diva Designs, Brenda Quin for a stunning collection that encapsulates her combination of combining boldness with femininity while the Best Menswear Collection went to well-known fashion writer and award winning designer, Chu Suwannapha and his brand Chulaap. Trained in Paris and resident in South Africa for 18 years, Chu was raised in Thailand but boldly celebrates the diversity of Africa through graphic, print oriented designs. Deputy Mayor, Councillor Fawzia Peer opened the Durban Fashion Fair Recognition Awards, declaring that the entire endeavour was a noble cause. They noted that the eThekwini Municipality had invested approximately R40 million in various fashion development programmes over the past six years which had enabled it to touch the lives of more than 1,800 designers, many of whom had gone on to showcase not only their creations internationally but had also built businesses and created jobs. She noted that fashion had an important part to play in the economic development agenda of the city and said that the DFF was an important foundation for the creation of sustainable businesses in the city of Durban. “The DFF must be viewed as a symbol of greatness, of what we can achieve when we work together and we are grateful to all of those who have played an active role in making this event such a success,” Peer said. Martin John Steenkamp, whose label Martin John encapsulates androgynous design with menswear pieces that channel into women’s wear took home two prestigious awards - Fashion Innovator Award and the Next Generation Emerging Designer Award. 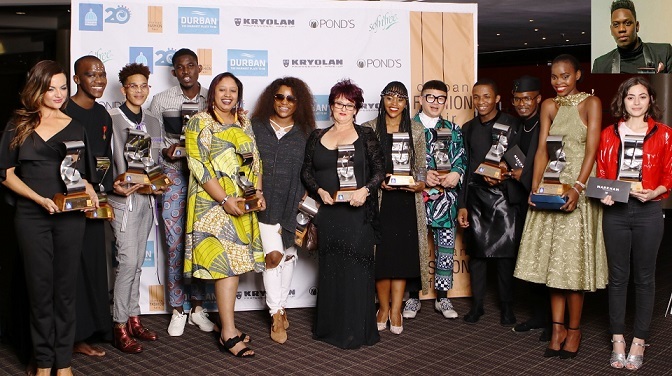 The Durban Fashion Legend 2018 which is based on nominations from within the local fashion industry went to Amanda Laird Cherry while the Fashion Business Award went to make-up house, Kryolan. Five years ago, the DFF introduced a model search, providing an opportunity for youngsters from disadvantaged communities not only to get themselves on the DFF ramp but also to begin to build a modelling career.